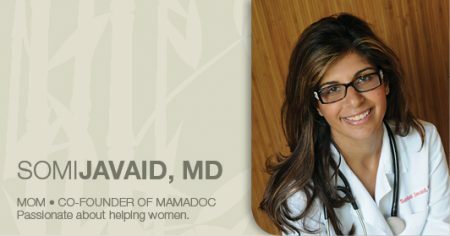 Combining traditional medicine with a holistic approach Dr. Javaid prides herself on her approachability factor with patients. “One thing I have heard time and again is that my patients find it easy to talk to me,” says Dr. Javaid. When they talk, she listens. Through the years she heard complaints that came up time and again during the pregnancy and post pregnancy process. This helped Dr. Javaid focus on developing products that offer practical solutions. Being a mother of three also gave her unique insight and motivation to solve some of the common concerns of new motherhood. So, she and business partner Kim Howell decided to pursue their dreams of helping women everywhere by creating mamadoc , a company designed to develop and deliver practical pregnancy products. She and her family live in Ohio where she is in active practice and is currently working on her first book, An Insider’s Guide to Pregnancy, Delivery, and Motherhood. When her friend Somi began talking about developing solution oriented pregnancy products, Kim knew that they couldn’t sit around saying “what if”. Encouraging Somi to create a prototype for the first product, Nox compression bra, Kim enlisted her Mom to sew the creation that the two had envisioned. Kim remembers the days of nursing her sons as some of the best days of her life and hated the idea of weaning. The emotional separation was painful enough and adding the physical discomfort was overwhelming. “I did the ace bandage and cabbage leaf thing and still experienced discomfort” so when Somi told Kim of her idea for a compression bra (during a power walk around the soccer field) to help women ease the pain during the weaning process, she knew a product like this could make a difference. Many power walks and brainstorming sessions later and mamadoc evolved with various products to help women through pregnancy and post pregnancy. Kim is committed to women’s health and lives an active healthy lifestyle. She is a certified yoga instructor and teaches weekly ashtanga classes. She has over 12 years experience in the pharmaceutical industry. She and her husband live in Ohio with their 2 sons. She loves handcrafting and uses her spare time to create items from real flowers taking ideas from sites for unique Christmas gifts and other holidays. Some of her items can be purchased at Etsy.